Let me just start by saying I love Candace Cameron Bure! I’ve grown up watching her on television and I’ve followed her career for a while now and I have to say I enjoy the content that she’s a part of. I love how she’s focused all these years in being in Christian movies or projects that are for the whole family to watch and I think that says a lot about her. 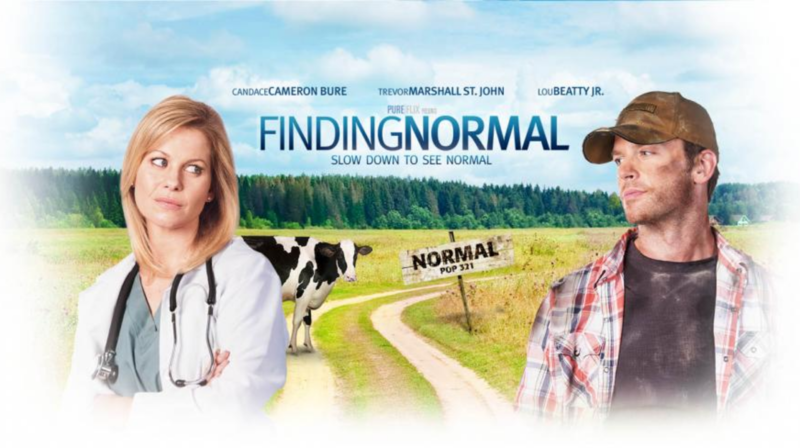 Finding Normal, the Christian movie, is about a surgeon who while driving on the way to the Hamptons to meet up with her boyfriend runs into something unexpected in North Carolina that take over her original plans. In Finding Normal we meet Dr. Lisa Leland and quite frankly, she is living comfortably and she thinks she has everything she’s ever wanted or needed. Lisa is a well-known doctor who has made a name for herself in the medical environment. She is now engaged with a gorgeous ring on her finger. Her fiancée has a similar background like hers and is an up and coming doctor with a very bright future and potential. To everyone they’re considered the couple every relationship wants to be like and they seem like they have their lives and futures figured out. Up to this point in Finding Normal, Lisa and her fiancée’s wedding is just around the corner and everything is going to plan. Little does she know that this will soon change. So Lisa from Finding Normal has to meet up with her fiancée in Long Island so she decides to drive cross-country from Los Angeles. This is a lot of miles to go through! Lisa begins her journey and when she’s passing through Normal, Tennessee, she is pulled over by a police officer and is blamed for speeding. Lisa tries to defend herself and explain but when the officer scans her license it is discovered that she has more than 20 unpaid parking tickets. Therefore Lisa is basically arrested and taken to a local judge to see what sentence they choose to give her. The judge mentions that she could go to jail for having so many unpaid parking tickets but since the judge is also the town’s pastor, he shows Lisa some mercy by sentencing her to three days of community service. Since Lisa is, in fact, a doctor, she will serve those three days as the town’s doctor but if she does not follow through on the agreement, she will head to jail. Now in this Christian movie we see a stressed Lisa as she thinks about how things are not going the way she had envisioned as she always likes to be in control. Immediately Lisa encounters various things that she’s quite not used to for example she is weirdly drawn to how quiet the town is and the lives that the locals live. Also, she’s noticed that the locals are authentic and real, not necessarily focused on having the most money or a prominent position. This is quite the opposite from the people Lisa’s encountered in the business world she had been grown accustomed to. In Normal, Lisa meets Lucas who is, in fact, the opposite of who she is. Even though they’re quite different, they form a great friendship as they get to know each other in these three days. Apart from Lucas, Lisa is intrigued with how the people of Normal live, how they go at a much slower pace and how they seem at peace. Her time in community service definitely causes her to do some soul-searching. Lisa begins to reevaluate her life, especially her relationship with her fiancée and has doubts about her true feelings for him. Since she was a doctor beforehand it had made sense for her to marry someone of the same caliber that she was in but now she has her doubts. Lisa’s time in Normal has come to a close as she’s finished her community service but she doesn’t know what to do. Lisa from Finding Normal, the Christian movie, can’t come to have the strength to leave the little town of Normal, Tennessee. She has grown accustomed to the way of living there and has grown close to not just Lucas but the other town members as well. She has to make a decision. What will Lisa’s decision be? Will she stay in Normal? Or leave and head to the Hamptons to her fiancée like she’d previously planned? Find out in Finding Normal!